Waterproofing is my life, Do Da, Do Da. I was 35 when I apprenticed as a roofer/waterproofer with Local 40 in SF. My first superintendent, Smitty, sang that ditty, every time something went awry. In waterproofing something often goes awry. My heart is breaking tonight over what went awry in Berkeley. Six young people were killed;five from Ireland and one from Rohnert Park in Sonoma County. Another seven were injured. That so many survived is a blessing, because the balcony, which gave way under them, was on the fifth floor. Most people don’t survive a fall at four stories. Horrible, but it may be that some provided cushion for the rest. The investigation that now is in progress will result in another phase that will be long and painful and expensive for all involved. Was the balcony overloaded? Were maximum load signs posted? Like me, everyone who knows something about engineering or exterior envelope waterproofing will have an opinion, and they are already speaking out. 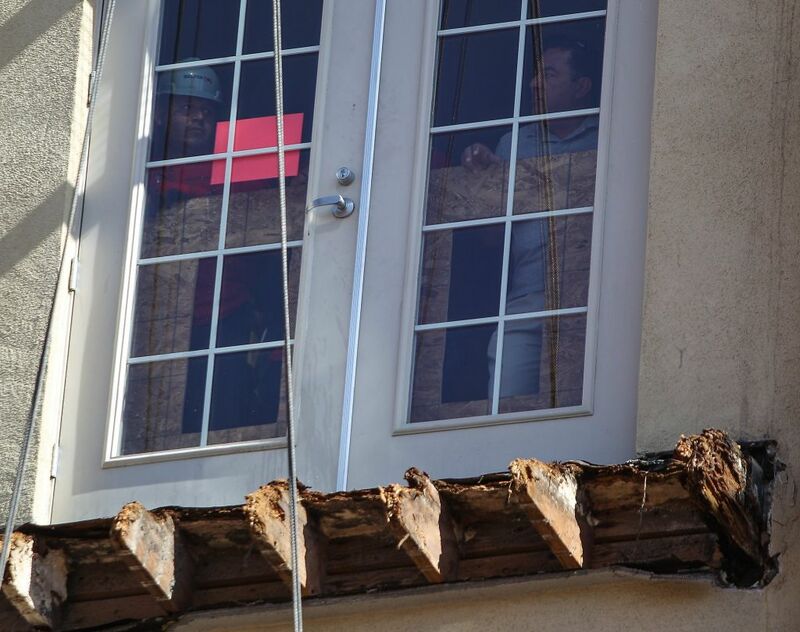 I won’t go into why I think this, but from the few pictures we have seen, it does appear to me construction defects and/or waterproofing damages are involved. When I started my own consulting firm in 1992, there were 35 other companies in the SF Bay area alone who were my competitors. We were all busy. Code requirements, though they were pretty good for roofing, sucked on waterproofing. Essentially the building code (Pretty much it still does.) said to follow whatever the manufacturer of the waterproofing product said. This led to manufacturers policing themselves. Some were good; many were awful. Now it’s true that there were institutes, dedicated to waterproofing, who provided building standards. If your project architect included those standards as part of the project documents there was a chance to improve the job by arguing standards even if the manufacturers literature, project drawings and written specifications failed to elucidate how things were to be done. Waterproofing success is often defined by elements that are less than 30 mils thick. It depends on knowing whether things like silicone and butyl are compatible. You have to know how much one product ¼” thick or less can stretch and recover as opposed to another. You have to know that water goes downhill except when it doesn’t. Can you say “permeability”? It requires diligence that ALL dust and debris are removed from the tiniest corners. The surfaces can’t be too hot or too cold. A wrinkle in a product is a leak. Waterproofing demands that surfaces are below the maximum moisture content. In the SF Bay Area, this is a feat. The presence of daily fog and dew set up a constant fight between the stamp-footed inspector and harassed contractor. If your mother or father was the kind who cleaned things with Q-Tips, toothpicks and toothbrushes, on a fast track schedule, over thousands of square feet, then, metaphorically, you might understand how this dance is performed. However, this dance assumes that there is an inspector on site who understands waterproofing. When I left there were still no required city, state, or federal, tests or certifications for waterproofing inspectors. That leaves a few engineers, architects, and other odd people like me, whom were first applicators, to fill the gap. I say odd, because the field of waterproofing takes specialization and time. Most engineers and architects have a lot of other things on their mind. There has been intense pressure on the construction industry for many years now to build faster, cheaper, faster cheaper. Building speculation and greed drive it. In California the madness of 20-year buildings, often on flood plains, were finally slowed by Jerry Brown, when he argued for and then the court disbanded redevelopment agencies. Architects and engineers have been underbidding just to stay in the game with skeletal documents and very little contracted oversight. General contractors take the lowest bids from subcontractors who have little understanding of upon what they are bidding. While other inspectors are required to meet structural standards, it takes an unusual developer/ owner to add a good waterproofing consultant or inspector, and spend the extra bucks for one. They are so important because they are the owners’ eyes and ears whose reporting can help prise apart the arguments that will arise. I was fortunate to have one-on-one training; however, we are long past the time in California where there is one apprentice for every two, roofing/waterproofing journey workers. It is typical today to have a crew of 10 apprentices to one journey worker. While this makes for less cost it produces copies of copies of experience, each apprentice a little less sharp at the end of their apprenticeship. Then, as a full paid journey worker they are less able, until they catch up on their own. There are hundreds of products and combinations of products on the market, with new ones all the time. As far as I know, in the field, most jobs are still sparse on manufacturers product and installation binders in English or Spanish unless the inspector has one. Yet they represent California’s, now International code on the job site. Then, once construction is completed, owners and building managers don’t always acknowledge that roofing and waterproofing have life spans and must be managed. It costs money to inspect, maintain and replace these elements. A building built to a 20-year life cycle is likely to need some waterproofing maintenance in the first three to five years. 20 years is the amount of time it takes for full tax depreciation. Owners typically sell the property after that. It’s a general truism in the roofing/ waterproofing industry that 90% of all construction defects and call-backs are leak related. That we have had so few accidents like this in California is a testament to the efforts of a decreasing number of knowledgeable workers, consultants, and a few dedicated manufacturers. Now however, a new generation of building, begun since the building freefall of 2009 is in peril. Previous workers were knocked out of the market in 2009 and moved on. Construction companies are now looking for experienced workers nationwide. Who will they find? Who is still there to train them? We need better code, (add.). certified inspectors, well trained workers, and architects and engineers who truly understand this stuff to be as important as the steel and wood waterproofing is meant to protect. What other business expects a 90% failure rate? Thank you for sharing your experience. I just learned a lot. Thanks, Aggie. Are you getting wet again? We may get some rain, but we talked to Houston friends, and Bill hasn’t lived up to his hype. Which is a blessing. Lou says somebody Killed Bill. I just have to say that the NYT report of this disaster is disgusting. There is no place for blaming young people who are just beginning their life exploration, for this tragedy. So, the NYT printed an apology from Margaret Sullivan. Apparently she is tasked with being their official apologist.